Stone's Ginger Wine is a popular Flavoured Wine available from TheDrinkShop in 70cl to buy online. Visit TheDrinkShop for the best price for 70cl of Stone's Ginger Wine or compare prices on our other Flavoured Wine products. ESTABLISHED 1740. PRODUCED & BOTTLED BY STONE'S OF LONDON. Stone's Original Ginger Wine was first produced in 1740 at the Finsbury Distillery in London, and still uses the traditional ingredients; finest raisins and pure ground ginger. Stone's is very versatile. As well as the famed 'Whisky Mac'. Stone's Original can be enjoyed all year round in a variety of cocktails and delicious food recipes. 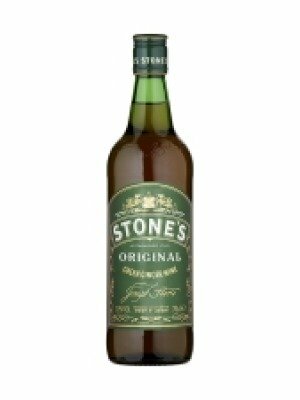 Where to buy Stone's Ginger Wine ? Stone's Ginger Wine Supermarkets & Stockists. You can buy Stone's Ginger Wine online in most retailers and find it in the Flavoured Wine aisle in supermarkets but we found the best deals online for Stone's Ginger Wine in TheDrinkShop, Tesco Groceries, Tesco Wine, Waitrose Cellar, and others. Compare the current price of Stone's Ginger Wine in 70cl size in the table of offers below. Simply click on the button to order Stone's Ginger Wine online now.